The hotel was clean, very close to a taxi station and the breakfast was fine. Great location and the staff were welcoming and the manager spoke good English. The WiFi signal is strong. The room was cleaned properly. 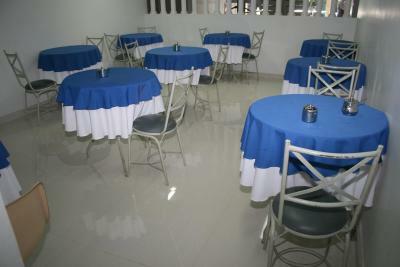 Café da manhã razoável. Camas e acomodações bem razoáveis também. Muito bom o café matinal com opções de frutas frescas, pães do dia com ovos mexidos. Uma boa cama e um bom quarto com ar e tv em bom estado. Banheiro razoável e limpo. Excelente localização com um bom café matinal com algumas opções, um bom quarto e um bom ar-condicionado. Colocaram duas camas de solteiro pra fazer uma de casal, café da manhã com pouquíssimas opções. Hotel El Pilar This rating is a reflection of how the property compares to the industry standard when it comes to price, facilities and services available. It's based on a self-evaluation by the property. Use this rating to help choose your stay! Less than half a mile from Brasília shopping center, El Pilar includes breakfast, free Wi-Fi and air-conditioned rooms. Esplanada dos Ministérios is 1.5 miles from the hotel. Brasília International Airport is 8.5 miles away. With a TV and minibar, these practical rooms are simply decorated. All feature a private bathroom with a shower. Hotel El Pilar is just under 1 miles from Brasília’s convention center, and 2 miles from UNB University. The city train station is 5 miles away. When would you like to stay at Hotel El Pilar? This air-conditioned room offers a mini-bar, TV and private bathroom. This single room has a balcony, a TV, air conditioning and a minibar. Hotel surroundings – This neighborhood is a great choice for travelers interested in museums, monuments and history – Check location Great location - show map Guests loved walking around the neighborhood! House Rules Hotel El Pilar takes special requests – add in the next step! Hotel El Pilar accepts these cards and reserves the right to temporarily hold an amount prior to arrival. The room and bathroom were a bit small, the main receptionist was not very kind and helpful, never smiling and no trying to make an effort with people who cannot speak Portuguese (though other members of the staff were really nice). Tazerhe hotel area of Brasilia is sadly not a very nice neighbourhood. old hotel need to be restalled.